Injection Molding | Tri-Mack Custom Plastic Parts Manufacturing Co.
As a manufacturing process, injection molding’s primary advantage is the low cost of conversion; the ability to transform plastic pellets into a complex shape in a matter of minutes. Tri-Mack specializes in the injection molding of high temperature engineering thermoplastics. Our molding machines and auxiliary equipment are specially equipped to process materials such as Victrex PEEK, Torlon (PAI), Ultem (PEI), Amodel (PPA), and Ryton (PPS). With injection molding machines ranging in size from 28 to 600 tons, we can support your needs for custom molded plastic components both large and small. Insert molding is a cost-effective process that yields high quality assemblies. Metallic inserts are loaded into a mold and once the plastic is injected, the part is molded around the inserts creating an assembly. With the proper insert design, retention is excellent. Tri-Mack’s extensive experience with insert molding led to the development of technology used in our molds that improve the true position accuracy of our molded inserts. Our state-of-the-art fully automated molding cell consists of a 330-ton tie-bar-less Engel molding machine and 5-axis robot. 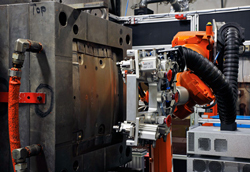 The robot prepares and loads metallic inserts, removes molded parts from the tool and carries the molded parts through a series of processing steps. The consistency of the automated process improves part quality while the reduction in manning lowers your costs. Tri-Mack has developed technology to combine continuous fiber reinforced thermoplastic composite (TPC) laminates with traditional injection molded materials. By marrying the superior mechanical properties of thermoplastic composites with the design flexibility of injection molding, Tri-Mack can create lightweight thermoplastic parts with enhanced performance. With this enabling technology, Tri-Mack can work with you to replace heavy metals and highcost thermosets in applications never thought possible. Learn more here. Solvay’s Torlon is a polyamide-imide resin that offers excellent electrical properties, toughness and mechanical property retention at elevated temperatures. Torlon requires specialized equipment and processing and Tri-Mack is a Solvay-approved molder of Torlon. We have a Roboshot all-electric molding machine dedicated to the molding of Torlon components as well as programmable ovens used to satisfy Torlon’s post cure requirements.